It is a roughly six-minute drive from Theodore Roosevelt Island to Fort Marcy along the George Washington Memorial Parkway, a route predominantly used by commuters in the Washington, DC metro area. Most, however, are completely unaware of the charming underworld that lies just below—a sliver of lush greenery between the parkway and the Potomac, a peaceful escape from the bustle of the city, and an amalgam of jagged rocks, splendid riverside views, and unexpected waterfalls. Through this slice runs the Potomac Heritage Trail, a lengthy track that runs for dozens of miles from the DC suburbs to the Blue Ridge Mountains. Yes, it is easier to drive, but the parallel trail structure is worth the extra effort. 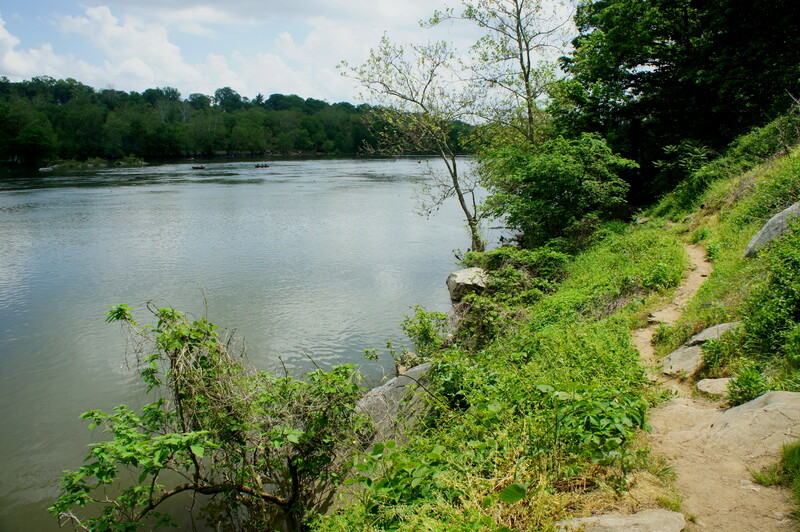 This post covers the first section of the Potomac Heritage Trail, beginning at Theodore Roosevelt Island and ending at Fort Marcy—a 4.7-mile trek through surprisingly rugged territory. 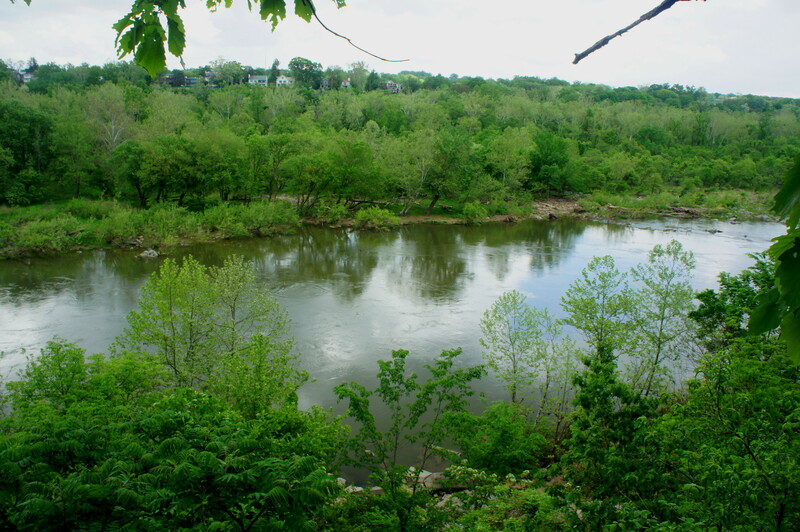 For city dwellers, this hike is easily accessible from the Rosslyn Metro, and loop hikers can combine the trip with an easy walk along the C&O Canal on the DC side to return to the start. Begin by finding your way to the Theodore Roosevelt Island parking area—by car, by Metro, or by bus—in Rosslyn, Virginia. If driving, arrive early, as the island is a popular spot for walkers, runners, and bikers, especially on summer weekends. Fortunately, while the masses head for the island, you will bear left on the much less-travelled Potomac Heritage Trail; look for a weathered wooden sign at the north end of the parking lot. It reads: “American Legion Bridge 10.0 MI, Chain Bridge 4.0 MI.” This trip takes you a little ways past the latter. The narrow but well-worn trail begins by passing under a causeway (the Mount Vernon bike trail), then ventures past a couple open fields and into the woods. 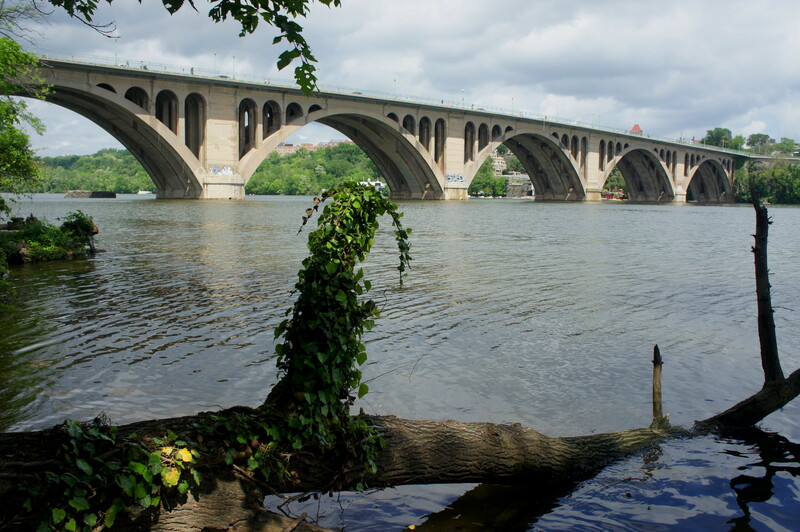 Following blue-green blazes, the trail soon approaches the Potomac River, offering views of the still waters, the Key Bridge, and the Georgetown waterfront (DC) beyond. Kayakers on the Potomac abound. After ¼ mile, the Potomac Heritage Trail crosses under the Key Bridge (sure to be clogged with traffic). Beyond, enjoy fleeting views of Georgetown University (HOYA SAXA!) and Jack’s Boathouse before the winding trail elevates for the first time to road level. 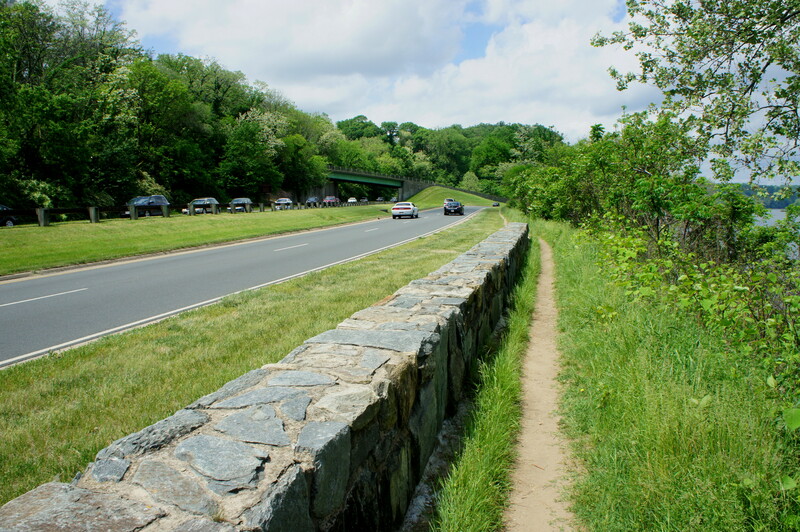 The next 2/10 mile or so are a bit odd: the trail runs parallel to the George Washington Memorial Parkway, allowing hikers to literally wave to passing cars as they zoom by. Soon enough, however, the trail darts back into the woods, and the sounds of engines are gradually drowned out by rustling of the Potomac waters and the chirps of blackbirds, robins, or cardinals. 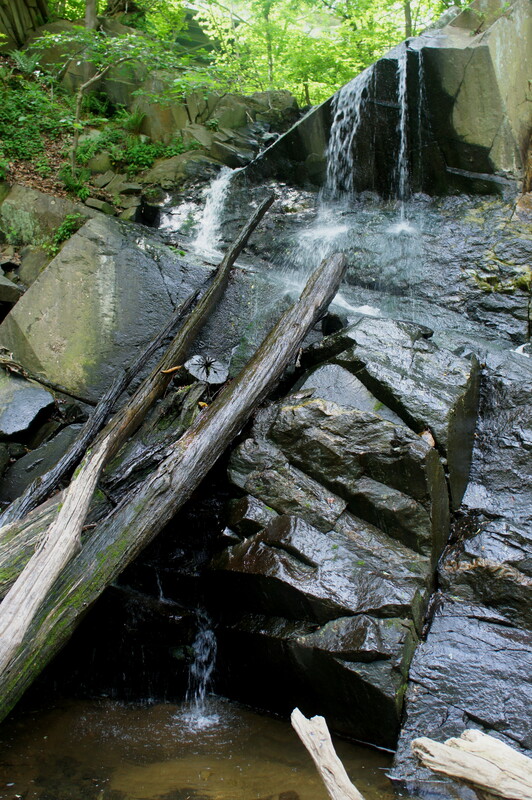 Around one mile from the trailhead, the route edges along a stone wall then traverses a wooden bridge over the mouth of Spout Run. 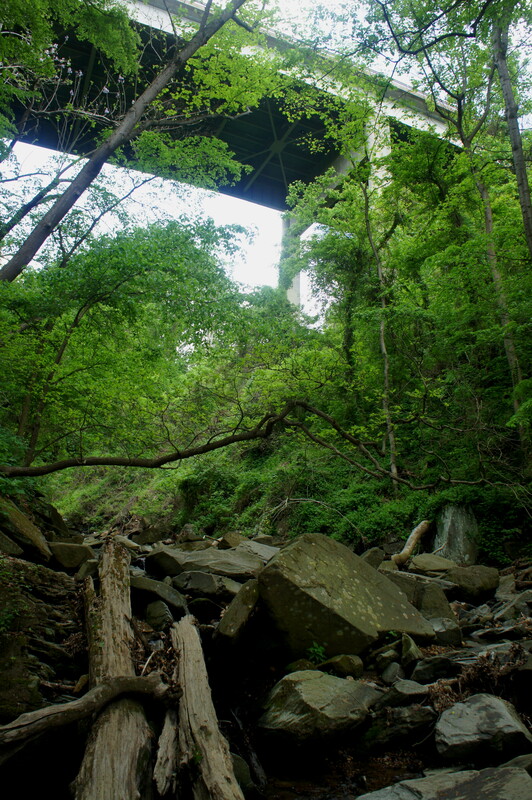 Through the gaping tunnel under GW Parkway, the creek tumbles over a series of minor cascades before merging into the Potomac. Beyond Spout Run, the trail keeps its distance from the GW Parkway (though the sound of cars is unfortunately ever-present) as it dips back into the forest. Ten to fifteen minutes from the bridge, the track enters a sunny clearing with a large rock outcrop visible on the left. It is also possible from here to spot joggers and bikers on the paved Capital Crescent Trail all the way across the Potomac in DC. After clearing a fallen log, hikers then drop back into the woods. The trail crosses a series of minor drainages, some of which may bear water. In spring, there is at least one steady trickle that can be heard dropping from the greywacke walls above. 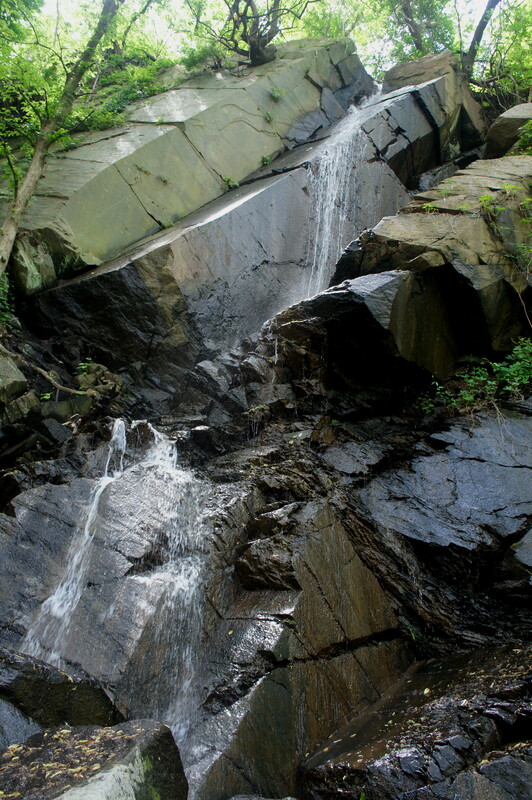 At 1.7 miles, the sounds of dripping water amplify as hikers reach the Windy Run junction. Off to the left, the creek drops—in some spots vertically—over a rocky terrace. 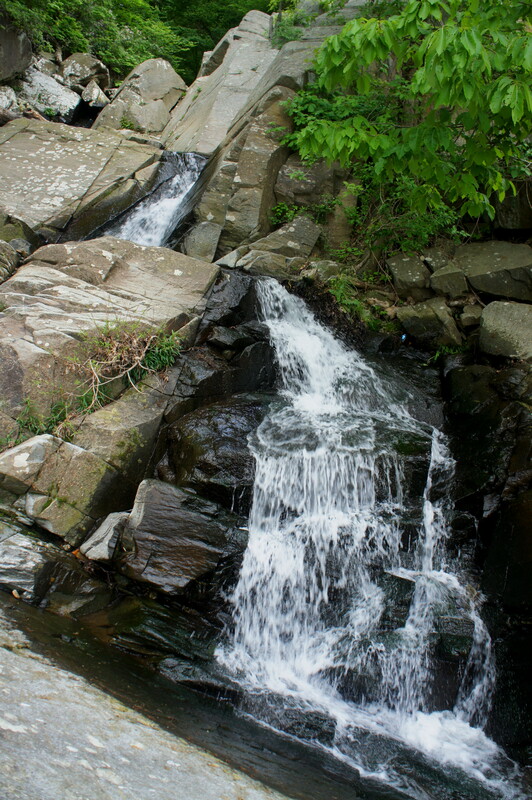 Who knew—a 30-foot waterfall so close to the bustling metropolis of DC? Venture up to the base of the falls for a snack break before returning to the main trail, which crosses Windy Run and continues westward. Lace up your hiking boots, as the route from here on becomes considerably more rugged. 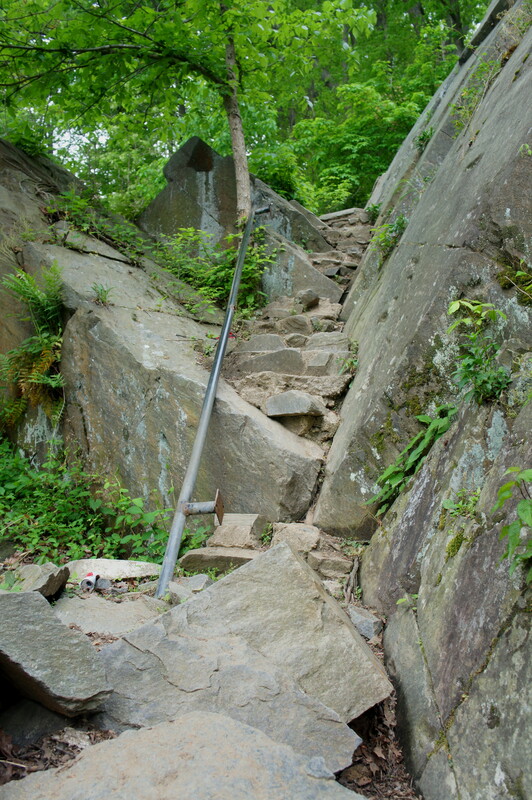 Rock outcrops must be cleared, and fallen logs surmounted. Roughly 10-20 minutes from Windy Run, another waterfall can be heard on the left. This one is more difficult to reach, but—flow permitting—can be just as impressive. 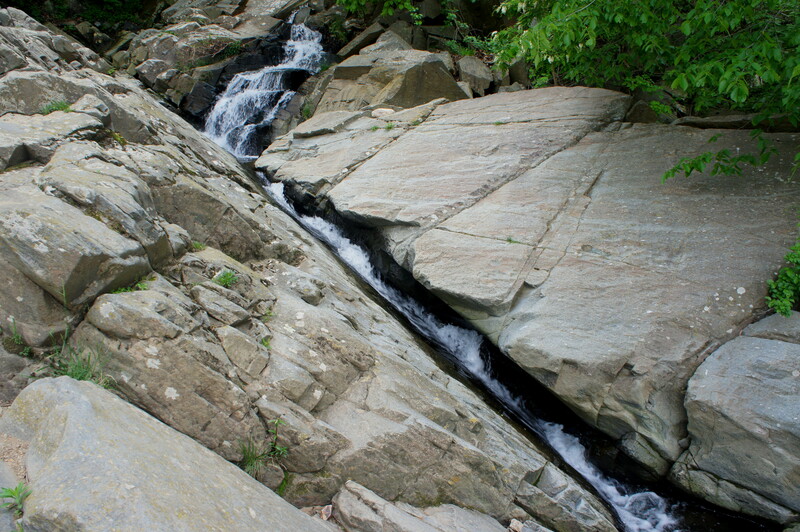 Here the stream slides down a series of rocky steps perhaps 40 feet high, ending in a small pool. Past this second falls, the dense tree canopy and green understory thickens, obscuring the towering rock faces off to the left. A few historical remnants of 19th or early 20th century Washington can be found scattered about—exposed pipes, old storage sheds, etc. As the trail pulls level with Fletcher’s boat house (across the river in DC), it begins to climb 30-40 feet to a point offering unobstructed views of the Potomac. More times than not, locals can be spotted fishing on either side of the water. Dropping back down to near river level, the Potomac Heritage track crosses Donaldson Run around mile 3. 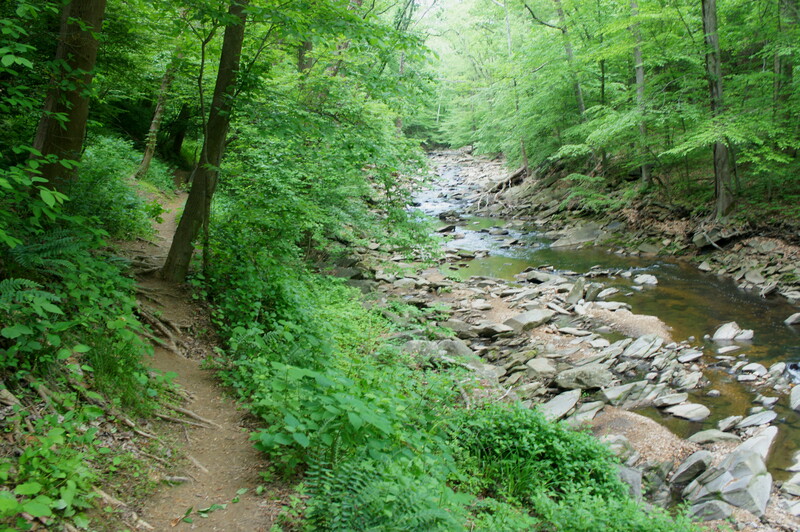 This creek bed, though rocky, is relatively wide and free of serious cascades. The GW Parkway makes an appearance again—this time as a bridge towering more than 150 feet above. Stay right at the trail fork—the Donaldson Run Trail veers off to the left—and carefully cross the creek. The next ½ mile includes a couple difficult scrambles up and over awkwardly-slanted rock outcrops—traverse with caution. 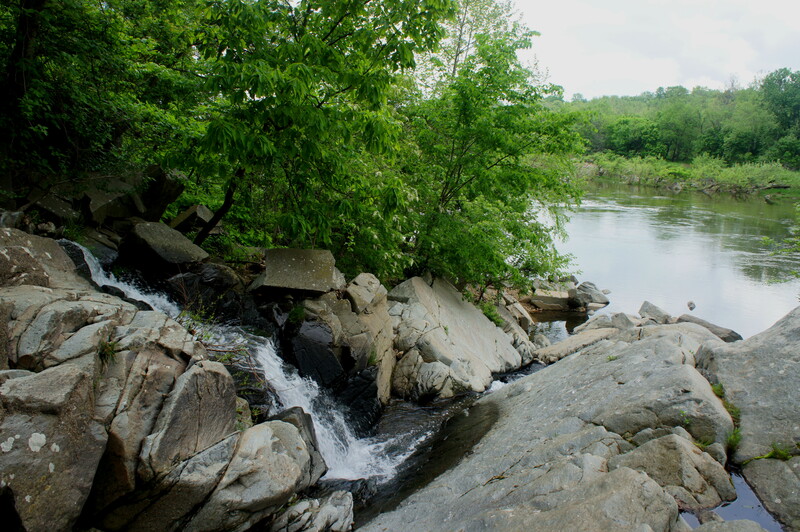 Just over 3.5 miles from Teddy Roosevelt Island, the hike crosses Gulf Branch, where tumbling waters zig-zag down the slope before shooting through a narrow flume down to the Potomac. Though not as high as the falls at Windy Run, the chute on Gulf Branch carries a greater volume, making it arguably the best of the bunch. From Gulf Branch, the trail gains perhaps 150 feet as it climbs high above the bluffs with sporadic views of the river. Wooden steps assist with the ascent. Gradually the track levels out and descends to a point crossing under GW Parkway. Stay right, bearing downhill to a poorly-marked path leading down toward Glebe Road and Pimmitt Run, the final tributary stream encountered on the hike. 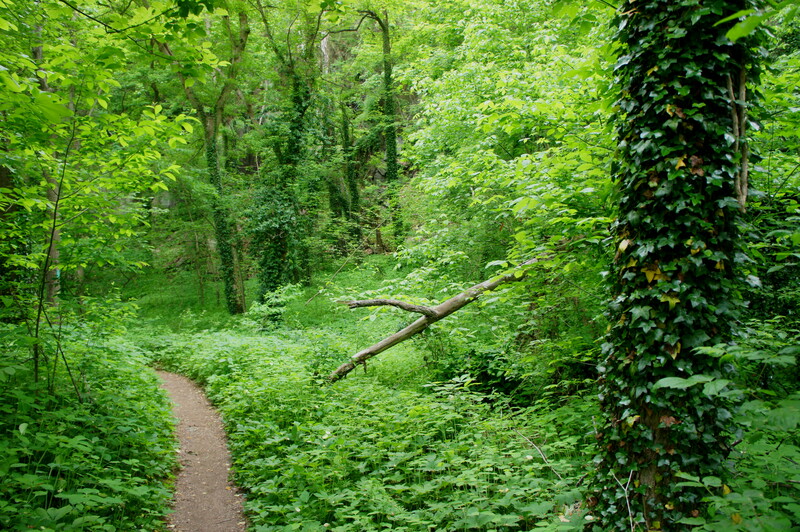 Here the blue-green blazes begin again, and the trail passes under Glebe Road. Turn left to follow a short spur track up to the road, which provides access to Chain Bridge. Many will call it quits here—turning back the way they came (for an 8-mile round-trip) or crossing over to the DC side to follow the C&O Canal Towpath Trail back to the Key Bridge. Those looking to extend the hike can continue onward to Fort Marcy Park by heading back into the woods for another 0.6 miles. Here the trail parallels Pimmit Run, crosses it, then climbs gradually through dense thicket to the Fort Marcy parking area. Though the sign says 4.1 miles, this point is actually nearer to 4.7 miles from Teddy Roosevelt Island. If a ride is waiting for you here, this is your terminus. For those returning to the start, double back the way you came or cross the Chain Bridge/Key Bridge to form a loop. Allot 3-4 hours for the moderately strenuous one-way hike, or 5-8 for the round-trip. 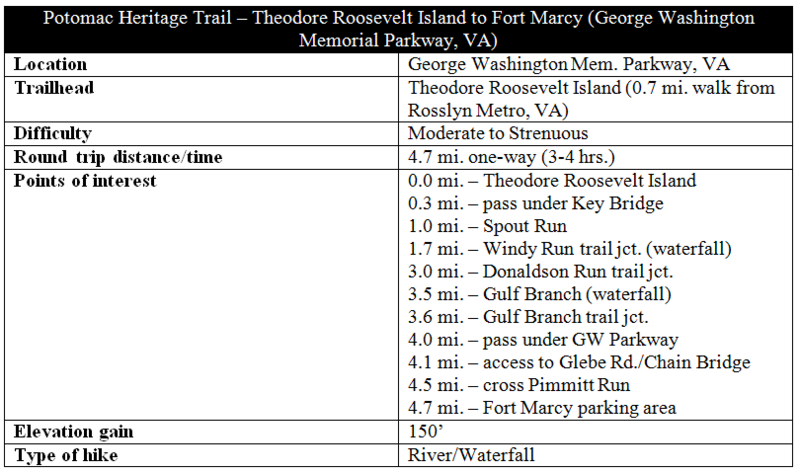 This entry was posted in George Washington Memorial Parkway, Moderate Hikes, Virginia and tagged Chain Bridge, Donaldson Run, Fort Marcy, George Washington Memorial Parkway, Gulf Branch, Gulf Branch Falls, GW Parkway, Key Bridge, Pimmit Run, Potomac Heritage Trail, Potomac River, Spout Run, Teddy Roosevelt Island, Theodore Roosevelt Island, Virginia, Washington DC, waterfall, Windy Run, Windy Run Falls. Bookmark the permalink.